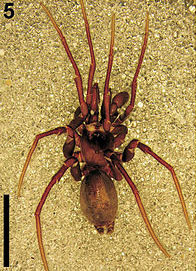 Male Calommata simoni, from Fourie et al. (2011). Scale bar = 5 mm. The Mygalomorphae are one of the main clades of spiders, characterised by chelicerae with fangs closing down the longitudinal axis of the body. Synapomorphies (from Jocqué & Dippenaar-Schoeman 2007): Labium and endites with cuspules; sternum with sigilla; anterior median spinnerets absent; anterior lateral spinnerets reduced; posterior lateral spinnerets with three or four segments; number of male palpal sclerites reduced. Megarachne servinei got reclassified as an eurypterid.